Two runners for the stable on Sunday with Lady Loft and Potemkin at Geelong. Lady Loft is the first to go in race two, the 3YO Maiden Plate over 1225m where she will jump from barrier three with Patrick Moloney in the saddle. The daughter of Roman Emperor finished fourth first-up over 1200m at Mornington on April 5 and Mike Moroney says has taken good benefit from the outing. “She’s drawn nicely in a stronger race so it’s important for her to be able to use the barrier and get away to a good start,” Moroney said. “She was respectable first-up but she was drawn wide and had to be used up so we would like to take advantage of the barrier today. Potemkin (pictured) resumes in race eight, the Benchmark 64 Handicap over 1325m where he will carry 59.5kg after the claim for Michael Poy. The four-year-old son of Testa Rossa has not raced since finishing fifth at Cranbourne last November. “We’ve used Michael Poy to help with some weight relief,” Moroney said. “There looks a bit of speed in the race but I’d envisage he will be on pace. 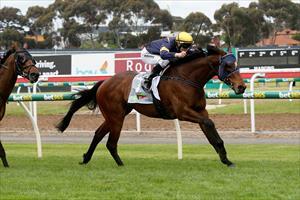 “He’s a stronger horse this preparation and trained well coming into this.